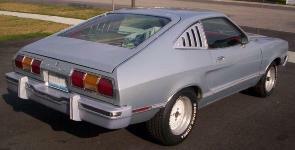 The 1976 Mustang II continued with a few changes and new option packages. All base models were classified as MPG models to emphasize the fuel economy features. The 2.8L V6 was now available with an automatic transmission. Two new option packages was the Stallion Group and the Cobra II package. The Stallion had a black grille and surround moldings without the emblem, black window moldings and wiper arms, bright lower-body side moldings, Stallion decals, styled steel wheels, and black lower quarter panels and bumpers. The Cobra II package included front and rear spoilers, simulated hood scoop, quarter window louvers, and snake emblems on a white with blue stripes or black with gold stripes paint scheme. The Cobra graphics designed by Jim Wangers credited for fathering the Pontiac GTO and the entire $325 option package okayed by Carroll Shelby. The VIN number is on top edge of the dash on the driver's side visible through the windshield.